– In recognition of the consistent CSR activities undertaken by MRIIRS (Formerly MRIU) under the aegis of Dr. O P Bhalla Foundation, ASSOCHAM bestows MRIIRS (Formerly MRIU) with this prestigious honour. Manav Rachna International Institute of Research and Studies (MRIIRS, Formerly MRIU) was felicitated with ‘ASSOCHAM – National Education Excellence Award 2015 for the ‘Best University serving Social Cause’at a glittering ceremony in New Delhi today. The award was presented by the Hon’ble Minister of State for Human Resource Development, Prof. (Dr.) Ram Shankar Katheria. Dr. NC Wadhwa, Vice Chancellor, MRIIRS (Formerly MRIU) received the award from Dr. Ram Shankar Katheria in the presence of eminent educationists. The Hon’ble Minister appreciated Manav Rachna for its social work. It is noteworthy that Manav Rachna Educational Institutions (MREI) have been bringing about massive transformation through incremental articulated steps in society through a series of CSR activities under the aegis of Dr. O P Bhalla Foundation. MREI has been carrying on the rich legacy and tradition of excellence which Founder Chairman Dr. OP Bhalla set as a precedent. Dr. O P Bhalla Foundation, a trust with philanthropy as its sole objective undertakes developmental activities, research and training in various fields, such as education, sustainable development and environmental protection, gender equality, health and well-being. The 8th ASSOCHAM Educational award bestowed upon Manav Rachna International University is a true reflection of the spirit and dedication with which the Foundation has catered to the needs of the marginalized while serving social causes like Ek Muthi Daan(a movement where nowhere sleeps hungry), community health camps,mega blood donation camps,Swachh Bharat Swasth Bharat,Waste management, Maintenance of the World’s Tallest Tiranga, and supporting the Beti Bachao Beti Padao campaign, among others. The Foundation is also working towards improving Gross Enrolment Ratio (GER) for higher education in the Faridabad District. 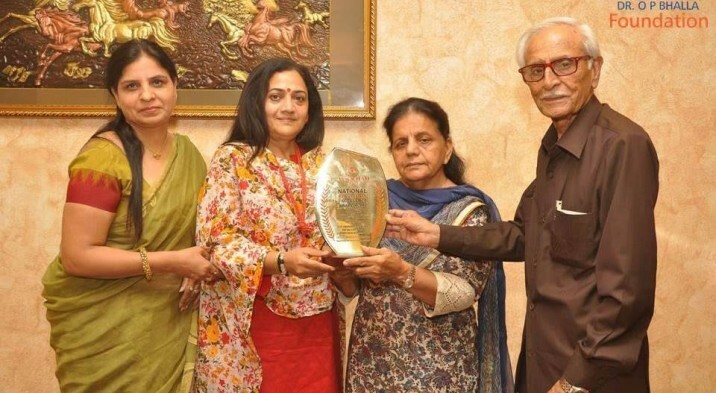 Ecstatic on receiving the award, Ms. Satya Bhalla, Chief Patron -MREI& Chairperson – Dr. OP Bhalla Foundationsaid:“The Foundation is a humble effort of making this world a better place to live and ensure that all the human beings get their due share of happiness. I thank ASSOCHAM for recognizing our efforts, and I am sure that as the Foundation continues its journey of spreading happiness and joy, more people will join us in this mission to help accomplish the dream of our Founder Chairman. Through such manifold initiatives,Dr. O P Bhalla Foundation has been working steadily towards the fulfillment of its goals and objectives. We all together can make a difference by Saving Lives…Transforming Communities….Renewing Hope”.